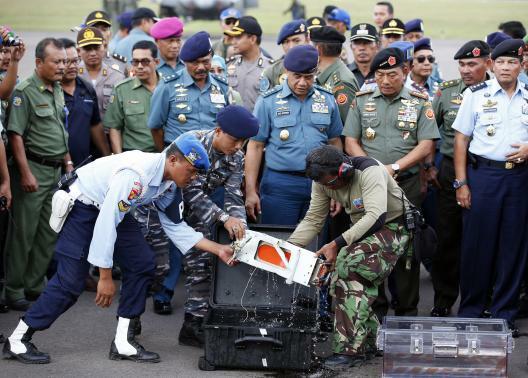 Indonesian divers have retrieved the cockpit voice recorder from the crashed AirAsia flight QZ8501, say officials. The retrieval comes a day after the first piece of the so-called black box, the flight data recorder, was also found and brought to shore. AirAsia plane with 162 people on board disappeared between Surabaya in Indonesia and Singapore on December 28. The two devices will help investigators understand more about what went wrong. Forty-eight bodies have been recovered so far, but most of the victims are believed to still be inside the fuselage. SB Supriyadi from Indonesia’s search and rescue agency said the fuselage had been located by divers about 0.9 miles from where the tail section was found last week. He said there were no plans yet to go down and retrieve it. The voice recorder was freed from underneath heavy wreckage of a wing from a depth of about 98 feet early on Tuesday, said Tonny Budiono, sea navigation director at the Transportation Ministry. “This is good news for investigators to reveal the cause of the plane crash,” he said. Santoso Sayogo, from the National Transportation Safety Committee, also confirmed the find to Reuters. An unnamed official involved in the search told reporters the device was now on board Indonesia’s Banda Aceh warship, in the Java Sea. The device – which records all conversations between the pilots – was being taken to Jakarta, where it will be analyzed by aviation experts. The flight data recorder – holding information about the speed at which the plane was travelling, its altitude and other technical information – is already in Jakarta. Flight recorders are designed to survive a crash and being submerged in water. They contain underwater locator beacons which emit so-called “pings” for at least 30 days. These pings were detected by search vessels at the weekend but divers were prevented from going down to find them by strong currents and high waves.